Mexican light-middleweight Saul Alvarez recorded the 45th win of his career as he knocked out American James Kirkland in the third round in Houston, Texas. Alvarez, whose only professional defeat came against Floyd Mayweather in 2013, floored Kirkland in the first round and twice more in the third. The 24-year-old hopes to fight Puerto Rico's Miguel Cotto, the WBC world middleweight champion, later this year. "I did not see the punch coming that knocked me out," said Kirkland, 31. Kirkland collapsed on his back after taking the knockout punch just moments after getting back to his feet from a previous knockdown. 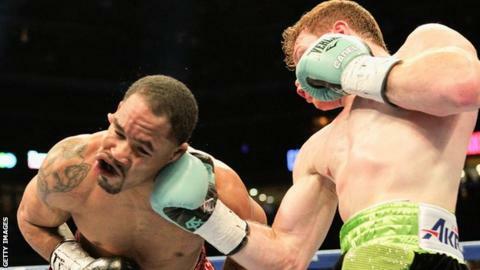 Alvarez - nicknamed Canelo, or Cinnamon, because of his red hair - celebrated for a moment before realising Kirkland was still on the canvas. "I was a little worried about him but as soon as I found out he was OK, I started celebrating again," said Alvarez. Cotto, 34, defends his WBC title against Australian Daniel Geale in New York on 6 June. Alvarez, a former WBC and WBA world champion, wants to fight Cotto in a pay-per-view bout in the autumn. Meanwhile, Felix Sturm missed out on becoming the first German to win five world titles as he suffered a points defeat by Russia's Fedor Chudinov for the vacant WBA super-middleweight title. Sturm, 36, was fighting for Carl Froch's former title, after the WBA stripped the British fighter of his belt last week because of inactivity. Froch has not fought since 31 May 2014, when he beat George Groves with an eighth-round knockout at Wembley Stadium. Chudinov, 27, had knocked out 10 of his previous 12 opponents and was fighting for only the 13th time in his professional career. Two judges gave him the decision in Frankfurt by 116-112 margins with a third scoring it 118-110.